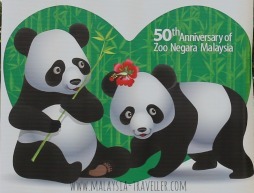 I have visited Zoo Negara many times but I took my family there again in August 2014 now that they have the recently opened Giant Panda attraction. Here is my review. 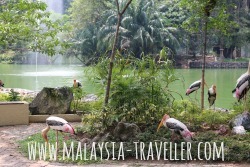 It's Malaysia's largest zoo, covering 44 hectares (110 acres), making it twice as big as the second largest, Melaka Zoo. It is located on the north eastern outskirts of Kuala Lumpur in the shadow of the spectacular Bukit Tabur (Klang Gates Quartz Ridge). Although urban development has more or less surrounded the zoo, it is still a green and pleasant area. 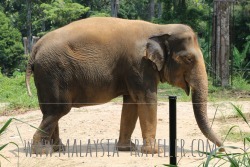 The zoo is managed by a non-governmental organisation, the Malaysian Zoological Society, and relies on ticket proceeds together with corporate and private sponsorship/donations to offset its considerable running costs. 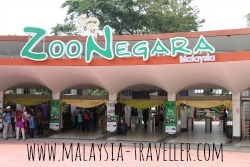 Zoo Negara celebrated its 50th anniversary in November 2013. 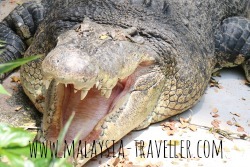 The exhibits are spaciously arranged around a scenic lake and landscaped with mature trees including a sprawling giant banyan, reckoned to be one of the largest banyan trees in the Klang Valley. According to the zoo's official website, the zoo has 5137 creatures from 476 species of mammals, birds, reptiles, amphibians and fish. 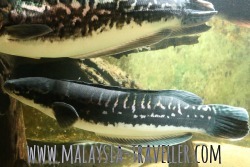 Indeed the sheer variety of animals is impressive with all the major species represented. The zoo is moving towards an open concept with the aim of giving animals freedom to move around and allowing visitors to view them unimpeded by cages. 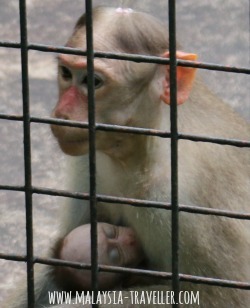 Having said that, there are still too many animals behind bars for my liking and, for a 50 year old zoo, it is not surprising that some parts are showing their age. Updating and improvement work was in progress during my visit. The zoo's new star attraction is undoubtedly the pair of 8 year old Giant Pandas called Fu Wa and Feng Yi on loan from China who are still settling into their new environment. A huge purpose-built structure has been constructed to house the pandas, chilled by powerful air-conditioning and landscaped with grass, artificial rocks, a waterfall, trees and foliage. No expense has been spared to make the pandas comfortable and the panda-house even has a kitchen to prepare panda cakes and a clinic in case of emergencies. Zoo employees remind visitors to remain silent to avoid stressing the pandas but it is difficult for children not to squeal with delight when they see the cuddly creatures. I can see how this 'panda diplomacy' aids China by promoting its image abroad and as a way of rewarding nations who are friendly towards China. 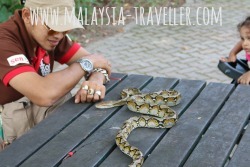 It is also good for the zoo by boosting visitor numbers and raising much needed revenue. 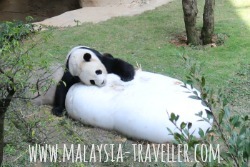 But while it is lovely to see pandas in Malaysia, I can't help wondering if it is in the best interests of the pandas. Having visited the Research Base of Giant Panda Breeding in Chengdu last year I think the pandas would probably be happier remaining there where the climate is more suitable, where their bamboo diet is readily available and where there are more pandas for company. One of Zoo Negara's giant pandas is seen here cuddling a block of ice to remain cool. In the same way that China has designated the Giant Panda as a national treasure with fully protected status, Malaysia should consider declaring one or more of its unique and endemic species as national treasures. The orang utan would be an obvious choice. Attractive setting next to Bukit Tabur and convenient, easy-to-get-to location. Scenic lake with free flying storks and flamingos. The Show Amphitheatre is fun if you haven't seen that type of thing before. Only place to see Giant Pandas in Malaysia. Continued upgrading of open-concept animal enclosures required. Better variety of food outlets (all kiosks seem to have the same, limited menu). NB. When I visited, the ticket counters only accepted cash. Please bring sufficient cash to avoid disappointment. Tram tickets are RM8 per adult and RM5 per child (RM11 and RM9 respectively for foreigners). Open Daily from 9am - 5pm. 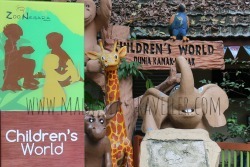 The location is marked on the interactive map on my Top Selangor Attractions page. A pay car park is available in front of the zoo. 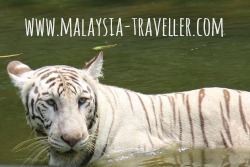 Need a hotel near Zoo Negara? Take a look at Agoda's website for a wide selection of hotels at discounted rates.